TOP 5 types of apps for Moms! It is not easy to be a mother, indeed: less sleeping nights, child’s growing needs and other family duties. So, to be able to handle with all of the maternity challenges and enjoy this great lifetime moms should be prepared not only physically, physiologically but also technologically. That’s’ why using various applications became must for nowadays mothers. We divided applications on TOP 5 types based on their usage field and issues they solve. Health & Care: Your baby’s and your health is very important, but we are so always busy that sometimes even forget about taking some medicaments, confusing treatments or medical recipes, etc. There are apps, like Mother & Baby 2018, Mother & Baby Care which could help you with this issue. They advise alternative treatments, gives tips on some health issues, how to treat them and other information related to being a mum (from a pregnancy stage to taking care of your baby). Fun & Entertainment: To not be stressed by lack of time and things to do every day we should have some fun. You can have a great time while taking pictures of your kid. Doesn’t matter if you are not so good in taking photos. There are applications which could make your pictures perfect. The one that captured my attention recently is the Baby Photo app. Very easy for use, you can edit your pictures with different filters, add creative artworks, personalized texts and even share photos via social media or email. By the way, it is free to download (on the Google Play), and the photos you share also have a chance to be featured on their Facebook or Instagram pages, which is pretty cool . There are also a huge number of games to play together with your baby via applications. Educative & Useful: It is very important to educate and develop your child from an early age. This education could be through story telling, songs, books. The challenge is moms are so tired sometimes that they have no more energy to read something for their kids. There are many educational apps, for example, Fairy Tales ~ Children’s Books, Stories and Games or Baby Games for 2 Years Old, which could teach your child various languages, reading stories, animal sounds, etc. Cooking & Nourishing: The situation with being nervous and wasting time on questions ”What to cook today?” or ”Is it allowed to feed my kid by this food?” can be avoided very easy and quickly. Just add in your phone some apps like Recipes For New Moms, Baby Meal Planner or others. By their help you can find nice recipes for a whole family as well as for your baby’s special nutritional needs. Organizing & Managing: To remember all events, where to go, what to do, what to buy and many other things we must keep in mind while so concentrated on our newborns is quite complicated. 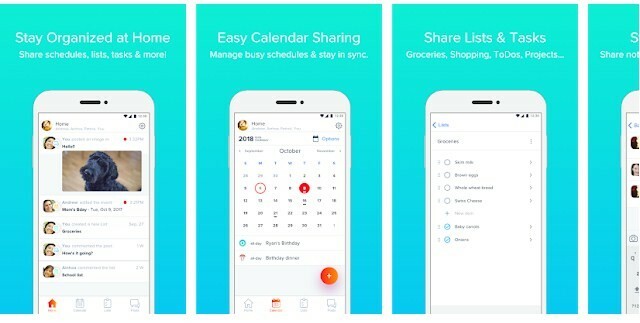 The best solution in this case is using organizers and time manager apps (like TimeTree – Free Shared Calendar, Hub Family Calendar Organizer, Smarter Time – Time Tracker – Time Management). Simply add information you need to be reminded about and go ahead with daily tasks to do. Next: When Should You Start Swimming Lessons For Kids?